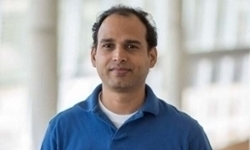 UNMC › Pathology and Microbiology › Faculty › Bios › Prabagaran (Praba) Narayanasamy, Ph.D.
Drug design, discovery and development (including drug delivery by nanomedicine) for infectious diseases. Study of physiology and pathogenesis of bacteria and virus towards drug discovery. Design, synthesis, and characterization of substrates, inhibitors, intermediates, products and mechanisms for drug discovery and development. For more details on Dr. Narayanasamy's research, please visit his webpage. MIP 298 – Introduction to Research, 2010. Choi, S., Britigan, B. and Narayanasamy, P. (2017). Ga(III) Nanoparticles Inhibit Growth of Both TB and HIV and Release of IL-6 and IL-8 in Co-Infected Macrophages. Antimicrob. Agents Chemother. 61, 4, pii: e02505-16. doi: 10.1128/AAC.02505-16. Choi, S., Larson, M. A., Hinrichs, S. H., Narayanasamy, P. (2016). Development of potential broad spectrum antimicrobials using C2 symmetric 9-fluorenone alkyl amine Bioorganic & Medicinal Chemistry Letters, 26, 1997-1999. Narayanasamy, P., Switzer, B.L. & Britigan, B.E. (2015) Prolonged-acting, Multi-targeting Gallium Nanoparticles Potently Inhibit Growth of Both HIV and Mycobacteria in Co-Infected Human Macrophages. Sci. Rep. 5, 8824; DOI: 10.1038/ srep08824. Edagwa, B., Guo, D., Puligujja, P., Chen, H., McMillan, J., Liu, X., Gendelman, H., Narayanasamy, P. (2014) Long-acting antituberculous therapeutic nanoparticles target macrophage endosomes. FASEB J., 28(12), 5071-82. Edagwa, B., Narayanasamy, P*. (2013), Synthesis of chirally pure 1-deoxy-D-xylulose-5-phosphate : A substrate for IspC assay to determine M. tb inhibitor. Chem Sci J 4:079. doi: 10.4172/2150-3494.1000079. Edagwa, B., Wang, Y., Narayanasamy, P*. (2013), Synthesis of azide derivative and discovery of glyoxalase pathway inhibitor against pathogenic bacteria, Bioorganic & Medicinal Chemistry Letters, 23(22), 6138-6140. Epstein AA, Narayanasamy P, Dash PK, High R, Bathena SP, Gorantla S, Poluektova LY, Alnouti Y, Gendelman HE, Boska MD. (2013) Combinatorial assessments of brain tissue metabolomics and histopathology in rodent models of human immunodeficiency virus infection. J Neuroimmune Pharmacol. 8(5): 1224-38. I. Kadiu, P. Narayanasamy, P. Das, W. Zhang, H. Gendelman. (2012) Biochemical and biologic characterization of exosomes and microvesicles as facilitators of HIV-1 infection in macrophages. J. Immunology. 744-754. P. Narayanasamy*,H. Eoh, P. J. Brennan, and D. C. Crick. (2010) Synthesis of 4-diphosphocytidyl-2-C-methyl-D-erythritol 2-phosphate and kinetic studies of Mycobacterium Tuberculosis IspF. Chemistry and Biology, 17, 117-122. P. Narayanasamy, H. Eoh, A. C. Brown, T. Parish, P. J. Brennan, and D. C. Crick. (2009). Expression and characterization of soluble 4-diphosphocytidyl-2-C-methyl-D-erythritol kinase from bacterial pathogens. Chemistry and Biology, 16, 1230-1239. P. Narayanasamy,* H. Eoh, and D. C. Crick. (2008). Chemoenzymatic synthesis of 4-Diphosphocytidyl-2-C-methyl-D-erythritol: A substrate for IspE. Tetrahedron Letters, 4461-4463. P. Narayanasamy* and D. C. Crick. (2008). Enantiomeric Synthesis of 2-C-Methyl-D-erythritol 2, 4- cyclodiphosphate. Heterocycles, 76, 243.